Jill Tanner, Felicity La Fortune, Will Lyman and Anthony Newfield in Merrimack Repertory Theatre’s production of “Equally Divided” by Ronald Harwood. Photo by Meghan Moore. 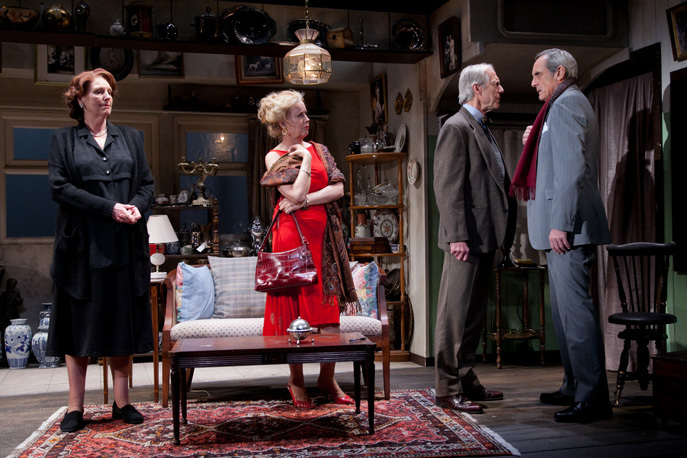 LOWELL — Merrimack Repertory Theatre has done well by British comedies, and Artistic Director Charles Towers has shown a deft hand in the past with comedy of any sort. So it’s no surprise that MRT has scored with “Equally Divided,” a delicious piece of work by prolific British playwright/screenwriter Ronald Harwood, renowned for his sharply-drawn, interesting characters, and now being performed in the Nancy L. Donahue Theatre through March 9. It doesn’t hurt that that Towers has at his command a finely-tuned quartet of actors that includes locally-based mainstay Will Lyman (Charles Mowbray), Jill Tanner (Edie Taylor), Felicity La Fortune (Renata Taylor) and Anthony Newfield (Fabian Hill). Right away, kudos to set designer Bill Clarke for a set that immediately draws you into the story. “Equally Divided” takes place in the Taylor homestead in the British coastal town of Bournemouth, a converted railroad car filled with interesting objects that has a backstory, and then some. It is a gray February day, the day after the matriarch of the Taylor family has finally passed away and been put to rest. Caring for her for many years — including the last three when she was bed-ridden — was her devoted spinster daughter Edie (Tanner), who has also enabled her mother to continue her lifelong obsession with antiquing that has left their home cluttered with objects of every kind. Edie believes it is time for her to be made whole for the fact that she has had “no life” for so long, while younger sister Renata (LaFortune) has visited her mother a handful of times in all those years. But what will the reading of the will by their family lawyer, Charles Mowbray (Lyman) bring, and where is that yellow piece of paper her mother was writing on wrote on just weeks before her death — a document that could hold the key to Edie’s future finances? Lyman is in fine form as Mowbray, a handsome widower whom Edie had hoped was beginning to show interest in her as something other than a client, only to find out he is enthralled with Renata, an “absolute cracker” who quickly charms the socks off the solicitor. When the will calls for the estate — which has only 4,000 pounds in cash — to be “equally divided,” Edie despairs for her future and wonders even whether she will be able to afford to live in her home. But what about the antiques? Renata dismisses the collection as “all junk,” but Mowbray offers to have it appraised by his man in London. Despite the abuse poured on her by both her mother and her sister, Edie is a person of high moral principles — or so she says. But she decides to contact a local antique dealer, Fabian Hill (Newfield), who agrees to come out and look at her mother’s collection. He compliments her on her “beautiful hands” and seems eager to not only value the antiques, but Edie herself. The spark of life hat has been hidden for so long underneath the dowdy exterior comes to the fore, drawn out by a failed actor who oozes charm, and opens the door to a pathway Edie had never considered before. After a heated argument, Renata storms back to London, and Edie will have to answer some moral questions when it comes to what will happen to her mother’s collection — and the proceeds from the sale. What is justice? What is right? What are just desserts? With Towers directing a cast of four old pros, there was very little chance of this production coming off the rails at any point, and “Equally Divided” gives theater-goers full value for their entertainment dollar.